Google Officially Deadpools Gears For Safari. Puts It On Death Watch For Firefox And IE. While digging through the Chromium forums back in November looking for clues about the then-unreleased Chrome for Mac beta, we stumbled on an interesting bit of information: Google was moving away from supporting Gears going forward. While this move was obvious for some given Google’s heavy investment in HTML5, Google hadn’t talked much about what would happen to their plug-in that allowed for things such as offline access to Gmail. They’re talking now. In a post yesterday on the Gears API blog, Ian Fette from the Gears team comes right out and says it in his title: “Hello HTML5.” Fette notes that the reason there haven’t been many updates to Gears in the past several months is because the team has shifted its focus towards implementing the same features into Chrome through HTML5 . So far, this includes Database API, workers, local storage, and web sockets. And soon, LocalServer API and Geolocation will be a part of Chrome as well, Fette notes. In essence, all of these features make Gears unnecessary — well, at least in Chrome, which Google obviously wants you to use. Because of this shift of focus, Fette notes that support for Gears will be increasingly “constrained in scope.” What this means is that beginning immediately, they will no longer be supporting Gears on OS X Snow Leopard (and later). Meanwhile, Gears support in Firefox and Internet Explorer will continue in limited form for now. But both of those too will eventually be killed off. “We will not be investing resources in active development of new features,” Fette writes. 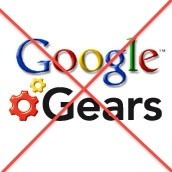 Really, all Google is waiting for is an effective way to migrate Gears-enabled apps (and their users) over to HTML5. While there is currently no good way to do this, it seems as if Google just may wait for developers to drink the HTML5 kool-aid and then kill of Gears support entirely — even if there are still some who are using it. I’m all for this. As I wrote back in December, I’m of the opinion that plug-ins are perhaps the biggest inhibitor of a unified web. That is, a web where everyone sees the same content the same way, no matter what browser or which OS they’re using. It doesn’t matter if those plug-ins are made by Google (Gears), Microsoft (Silverlight), Adobe (Flash), or anyone else.